Over the past week, the number of dreary, grey days has increased as the number of leaves on trees has decreased. Though I love apple cider doughnuts, loose and comfy chunky sweaters, snuggling into my winter comforter, and all other cozy autumn activities, it is always sad to feel the warmth of summer fade. But autumn brings its own vibrancy, with leaves like flames and multicolored fruits and vegetables ripe for harvest. I had always associated pomegranate seeds with summer because of their “tropical” fuchsia hue and the exoticness of a fruit whose seeds shone like edible jewels embedded in bitter white pith. However, after I discovered they were in fact a fall fruit, pomegranates became a favorite fall time treat (though of course, apple cider doughnuts will now and forever be the best part of fall). After a week of drab, depressing days drained of color, I needed something delicious, sweet, and visually striking, even borderline garish. Enter my favorite breakfast pastry, the scone, combined with my favorite exotic flavors, green tea and pomegranate seeds. 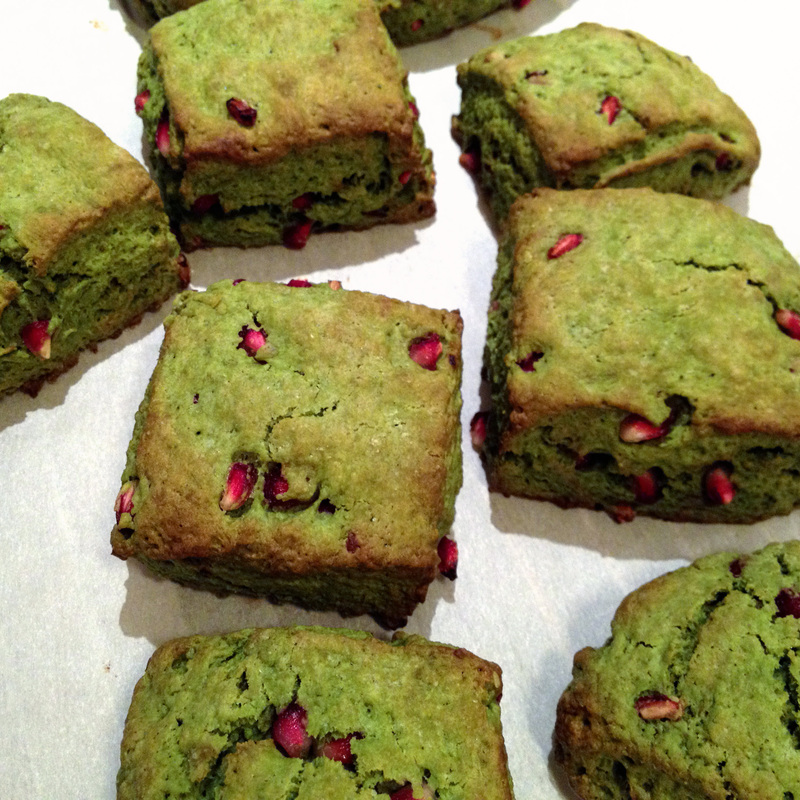 Matcha imparts an earthy, slightly bitter taste, while the pomegranate seeds provide small sparks of juicy sweetness. Paired with a mug of hot tea, these scones are rays of light on rainy fall days.